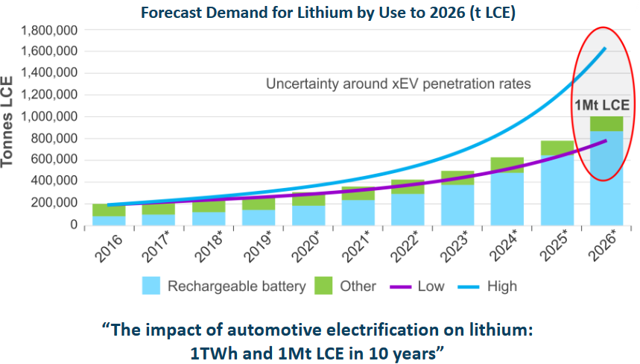 Lithium supply at the mining level is increasing. New mines will open in the next years and some existing mines will be expanded. But will it be enough to catch the surging demand ? "The key to understand is that demand is not just from booming electric car sales. There is plenty more demand from other EVs – e-buses, e-trucks, e-ships and e-boats, e-bikes, soon e-planes, the energy storage and electronics sectors. For now e-buses especially in China have been a huge demand driver for lithium. Soon we will have e-semis and all kinds of electric trucks. Just this last week Daimler announced two new electric trucks for the US market to take on the Tesla semi that was slated for 2019 production. A full size electric semi-truck will need about 10-16 times more batteries (and hence lithium) than an electric car."